Offering a garden with an outdoor pool, Casa Campanella Resort is located in Capoliveri, 1.5 km from the centre. Free WiFi access is available throughout. Each apartment will provide you with a patio and a satellite flat TV. Featuring a bath or shower, the private bathroom also comes with a hairdryer. At Casa Campanella Resort you will find a shared lounge and a games room. An array of activities can be enjoyed on site or in the surroundings, including cycling and hiking. 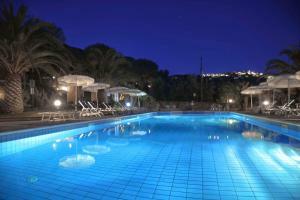 Porto Azzurro is a 5-minute drive from the property. Portoferrato Ferry Port is 13 km away. When would you like to stay at Casa Campanella Resort ? This studio features a satellite TV, a patio and free WiFi.2 extra beds are available upon request. With free WiFi, this apartment comes with a seating area complete with a satellite TV, a kitchenette and a patio. This apartment features a patio, kitchenware and barbecue. This apartment has a kitchenette, satellite TV and barbecue. This studio has a private entrance, barbecue and satellite TV. Each day we'll check prices and send you an email for your selected dates at Casa Campanella Resort. If you don't have specific dates but would like to check prices for say next weekend or say next month we can check the price too. Click to write a review and share your experience of Casa Campanella Resort with other travellers.